The World Jewish Congress hosted a special delegation of 70 Jewish leaders from 40 different countries in Jerusalem on 18-19 March 2018 for a two-day mission under the leadership of President Ronald S. Lauder focused on strengthening Diaspora-Israel relations, as part of a series of events celebrating 70 years of independence for the State of Israel. 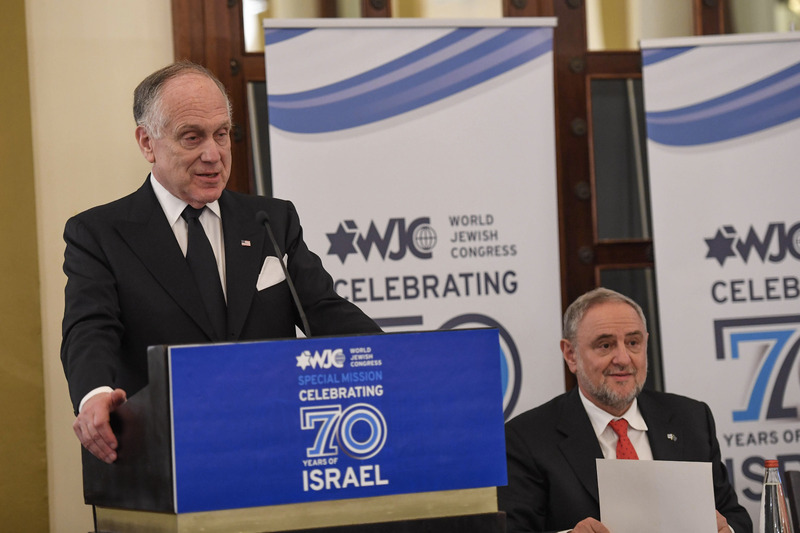 The mission culminated on Monday evening with the official opening plenary of the 6th Global Forum for Combatting Antisemitism organized by the Israeli Ministry of Foreign Affairs, including a keynote address by President Lauder. The discussion on the state of relations between Jewish communities in the Diaspora and the State of Israel continued into the second day of the mission, with a panel session led by Dan Meridor, president of the Israel Council on Foreign Relations, which operates under the auspices of the World Jewish Congress, with the participation of Mossad Chief Ephraim Halevy, President of the Board of Deputies of British Jews Jonathan Arkush, and former MK Einat Wilf. The delegates were treated to a special tour of the Western Wall and an in-depth discussion on this history of the site, where they then sat with Minister of Jerusalem Affairs Ze’ev Elkin for a lunch meeting. In addition to Lauder, the mission was hosted by WJC CEO and Executive Vice President Robert Singer, and WJC-Israel Chairman Gad Ariely.